First published in the December 1966 issue of Esquire Magazine as "The Awful Vista of the Year: the Fantod Pack" (along with the equally bleak "Chthonian Christmas"). The Fantod Pack has long remained one of the most elusive of the Gorey canon. A limited and signed edition was published by Gotham Book Mart in 1995, predictably fetching collector's prices. The Fantod Pack has finally been made available to the general public by Pomegranate Publications. What is the Fantod Pack? 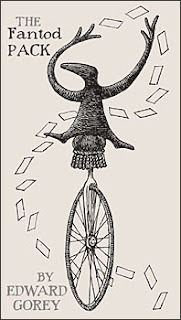 It's Edward Gorey's idiosyncratic take on tarot cards, but with a major difference: all possible fortunes foretold are dire. There are no happy endings and disaster lurks around every corner, or is hanging above your head, ready to crash down like a safe in a Warner Brothers cartoon.